Laureato nel 2010 in Odontoiatria e protesi dentaria con dignità di stampa. Co-autore della review: What is the optimal number of implants for removable reconstructions? A systematic review on implant-supported overdentures. Clin Oral Implants Res 2012. 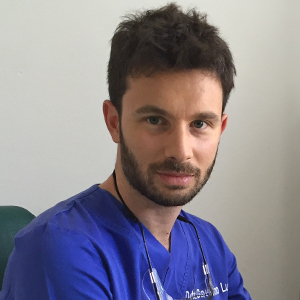 Co-autore dello studio: Surgical treatment of buccal soft tissue recessions around dental implants: 1-year results from a prospective cohort study. Clin Oral Implants Res 2013. Co-autore dello studio: Long-term (10-year) stability of soft tissues around implants following ridge preservation technique by means of collagen-coated bovine bone. Int J Periodontics Restorative Dent 2014. Co-autore dello studio: Surgical therapy of single peri- implantitis intrabony defects, by means of deproteinized bovine bone mineral with 10% collagen. J Clin Periontol 2016. Vincitore ad Osteology 2013 del premio per la miglior ricerca clinica con il lavoro: “Long-term (10-year) stability of soft tissues around implants following ridge preservation technique by means of collagen-coated bovine bone.” Durante il 2015 frequenta il corso annuale della Società Italiana di Parodontologia ed Implantologia (SIDP). A maggio 2015 partecipa al corso di dissezione anatomica tenuto dal Prof. Chiapasco e Roccuzzo.